HANNAH PEARLMAN, the only child of BEN and KATHERINE, comes home to tell her parents that she’s marrying a wonderful man. The only problem is, this wonderful man is the son of a Nazi, and her father is a Holocaust survivor. The play follows the family through time and memory as they come to grips with Hannah’s news, Katherine’s alcoholism, and Ben’s philandering. History’s shadow is personified in the play’s fourth character, KA-TZETNIK 15803, the gaunt and exhausted concentration camp slave Ben was when he was twenty and in Auschwitz at the war’s end. 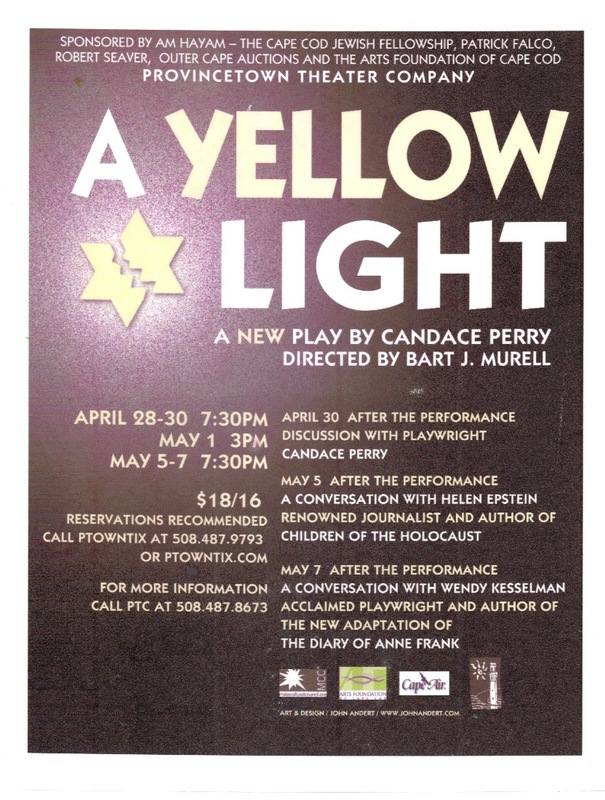 A YELLOW LIGHT was produced by the Provincetown Theatre Company in the spring of 2005. Rob Phelps reviewed the play for the Provincetown Banner and gave it high praise. If you'd like to read A YELLOW LIGHT, please download the PDF here. If you wish to perform the play, please contact me for permission and royalty information.